Blackberry tart made completely from scratch! 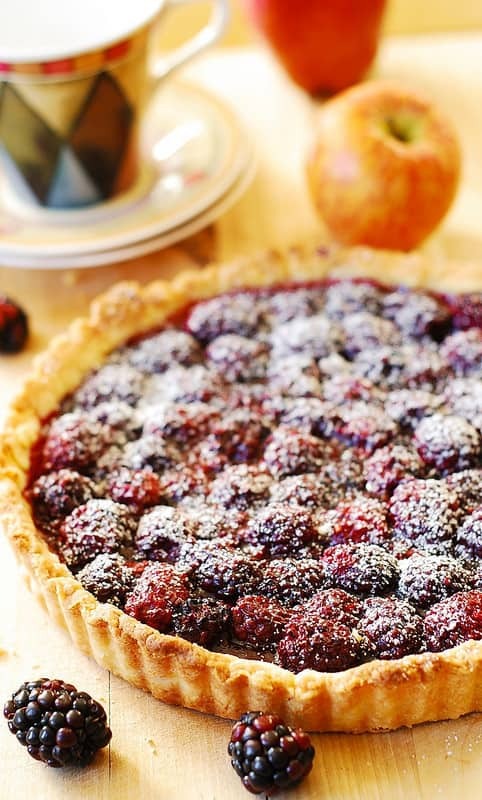 Fresh berries, homemade tart crust shell – you’ll fall in love with this beautiful French dessert. This recipe uses 9 inch or 9.5 inch tart shell. I once had way too many fresh blackberries (and they were not even that sweet), and this blackberry tart was a perfect recipe to use them all to bring out the best in berries! The tart turned out great, with fresh berries bursting in color and flavor in all of their glory, and with the lemon zest adding just the right amount of “oomph”. So, if you have lots of blackberries, this is the right recipe to use them! I have a separate, very detailed tutorial on how to make the sweet tart shell from scratch. Use 9 inch or 9.5 inch tart pan. Follow this tutorial’s instructions to bake the tart shell. 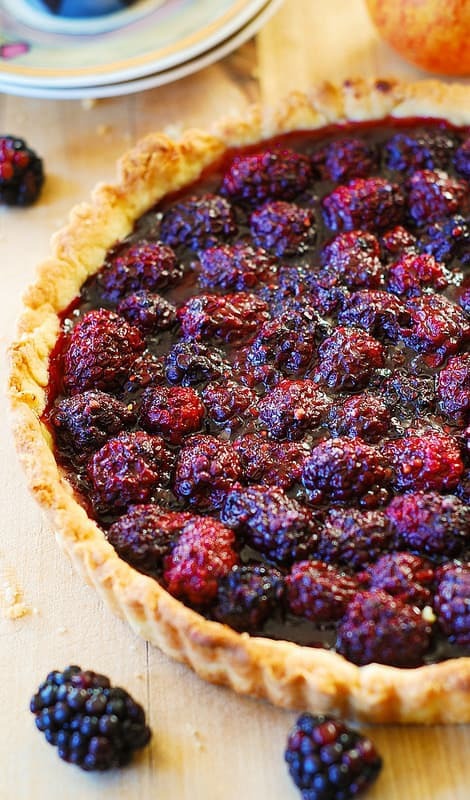 In this recipe, we are making sweet blackberry filling for our tart shell. In a large bowl, toss 4 cups of blackberries, 1 cup of white sugar, 1/2 cup all-purpose flour, 2 tablespoons freshly squeezed lemon juice, and 1 tablespoon lemon zest lemon zest. Combine and mix thoroughly. That’s it! Your blackberry filling is ready! Spoon this blackberry filling into the cooled tart shell. Top with the remaining 1 cup of blackberries. Sprinkle 2 tablespoons white sugar over the berries, and then sprinkle thinly chopped cold butter on top, too. 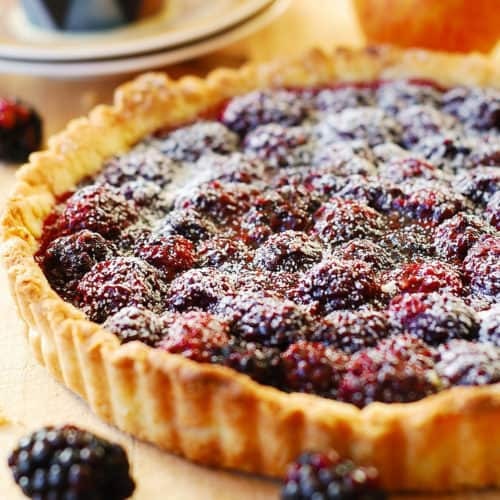 Place the blackberry tart on a rimmed baking sheet (to catch any juices) and bake for 30-40 minutes in the preheated oven at 350 F until filling starts to bubble. If crust starts to brown too much, place a piece of aluminum foil over the tart. This blackberry tart becomes even more exceptional when served warm, with a scoop of vanilla ice cream! Blackberry tart made completely from scratch! 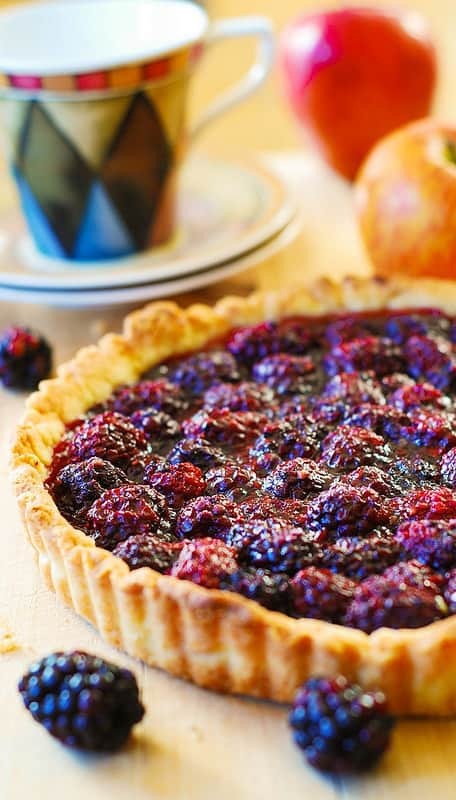 Fresh berries, homemade tart crust shell - you'll fall in love with this beautiful French style dessert. Prebake the 9 inch or 9.5 inch tart crust at 400 Fahrenheit for 20 or 30 minutes according to my super detailed tutorial how to make tart crust shell from scratch. Let the tart shell cool slightly. In a bowl, toss 4 cups of blackberries, 1 cup sugar, 1/2 cup flour, 2 tablespoons lemon juice, and 1 tablespoon lemon zest. Combine thoroughly. Place the tart on a rimmed baking sheet (to catch any juices) and bake for 30-40 minutes at 350 F until filling starts to bubble. If crust starts to brown too much, place a piece of aluminum foil over the tart. I followed the recipe exactly and it never set up. Juice everywhere. I even baked it longer than 40 minutes. I had my doubts when I read that you just toss the berries with flour. I guess maybe I had to be more vigorous and crush some of the berries? The flour seemed to just sit on the bottom of the pan when I poured the mixture into the crust. Or to say another way, How does one combine thoroughly? is very practical and made my task super easy. We tried it with indulgent heavy cream and it was beautiful. So glad you enjoyed this recipe! 🙂 Adding some cream on top sounds so good!